Close to two decades have now passed since the start of the 1994 genocide against Tutsi in Rwanda. Survivors of this tragedy are yet to see their right to reparation meaningfully honored despite several call for reparation that remained to date unheeded. The Government of Rwanda, genocide convicts and the International community have the primary legal and moral obligation to deliver reparation to this marginalized group if the country is to recover from the wounds of genocide. Lack of reparation is a violation of the right of survivors to complete justice. To this day, survivors continue to endure the social, psychological and material consequences of genocide. 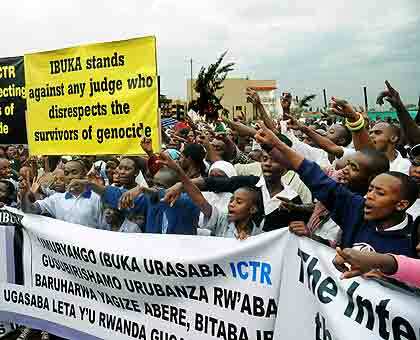 This negatively impacts on perceptions of justice rendered and the trust that survivors have in the national and international judicial institutions like the International Criminal Tribunal for Rwanda (ICTR). 2014 is the twentieth commemoration of the genocide, and will mark the closure of the ICTR. This presents a unique opportunity to deliver reparation to survivors of the genocide against the Tutsi in Rwanda for which the Government of Rwanda does not have the resources, and that the ICTR does not have the mandate. Survivors’ organizations in Rwanda are calling the international community and the Rwandan Government to establish an International Trust Fund for survivors of the genocide against Tutsi to serve as a sustainable and effective victim-centered mechanism to address this long-waited matter in Post-genocide era in Rwanda.